Let your voice be heard - email us your review of Bakubung Lodge, and we'll send you a travel voucher. "People of the hippo", as Bakubung is also known, is built in the shape of a horseshoe, designed such to ensure that guests have optimal views of the African bush and the wandering warthogs, hippo and buck that venture close to the entertainment areas, hotel studio rooms and chalets.The Pilanesberg Game Reserve is a comfortable two-hour drive from Gauteng, and is located just beyond Sun City in the Pilanesberg National Park. The Park is situated in an eroded volcano that is in excess of 1000-million years old, one of the oldest of it's kind in the world, it's rare rock types and structure make it a distinctive geological feature, rating high amongst the worlds outstanding geological phenomena. The Lodge is part of the Heritage Environmental Management Program and has been awarded Gold Status by the Heritage assessors for the past three years. The Lodge is currently in contention for Platinum Status. We visited Bakubung Bush Lodge, and not only did we catch this Vervet Monkey stealing sugar from our room, but we also enjoyed the game viewing in the rest of the Pilanesberg. The Mathews family spent 2 days at the Bakubung Bush Lodge the highlight of which was the safari trip, and in particular how close the wildlife got to their 4x4. Rom spent a night with her Mom at Bakubung Lodge (and apparently some daytime at the pool). 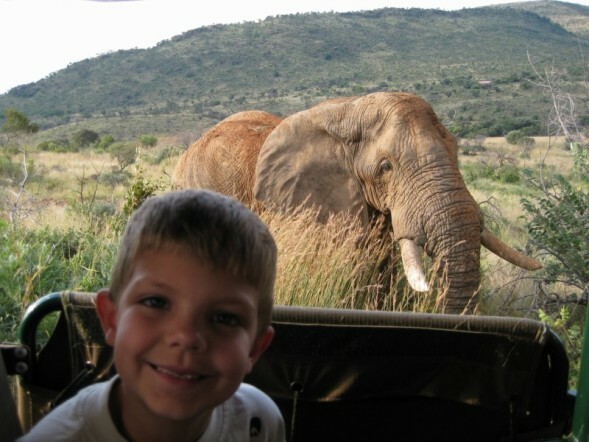 On their game drive they saw wild dogs, lions, elephants, hippo, rhino, giraffe, monkeys and much more. Bakubung Lodge's rooms (including one wheelchair accessible room) are arranged in a semi-circle (horseshoe) with a hippo pond in the middle, where warthogs and antelope are common. 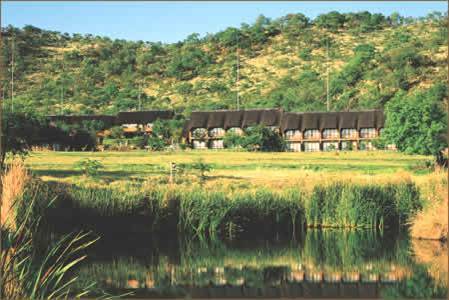 Bakubung Lodge is a 2 hour drive from Johannesburg or Pretoria. Go on game drive in the early morning and late afternoon/evening. 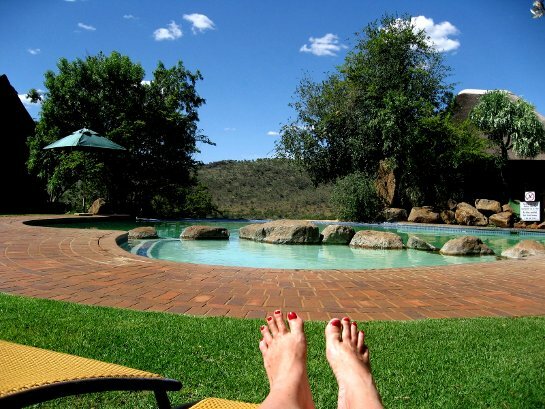 Sit around the pool during the day, or visit Sun City. Eat at the restaurant or have a South African braai (barbecue). Binoculars, to help see the wildlife. Seven wild dogs are released from their holding boma into the Pilanesberg National Park. Their last meal had been on the 20th Feb 2009, and an Impala carcass was used to lure the hungry dogs out of the boma. The dogs spent much of the remainder of the day resting in a thicket some one and a half kilometres from the boma, keeping out of the heat of the day. Later on in the afternoon they were sighted on Tshukudu E Ntsu drive - the first sighting of wild dogs in the Pilanesberg National Park in over a year. "Directly on the fenceline to the Pilansberg National Park, so if you are lucky you get to see some game at breakfast already." " there's a great pool with its own bar and views across a watering hole into the park." "I splurged and got myself a nice massage, great massage actually." " love to see from the bathtub out into the bush :-)"
" There's plenty to do - tennis, table tennis, etc. and of course organised game drives and a shuttle bus to Sun City if that's your gig." "from your room you can look out to the wild is amazing and only a small 4ft fence seperates the hotel grounds and 'the bush'."